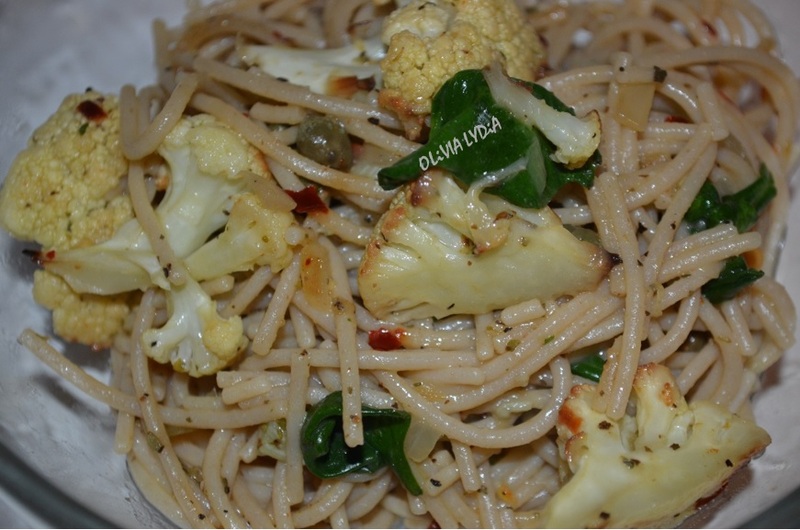 Angel-Capered Cauliflower – Olive For Greens. Roasted veggies, specifically, cauliflower are a fan favorite. Even if someone thinks they don’t like cauliflower, give them roasted cauliflower and they just may love it! I like making people into believers. Especially when I hear “I don’t like that!” or “Too many vegetables on one plate is yucky!” Challenge accepted! This dish is well-balanced with carb, veggie and spicy. The capers take this bite to another level. Try this as your Meatless Monday dish or even something new. 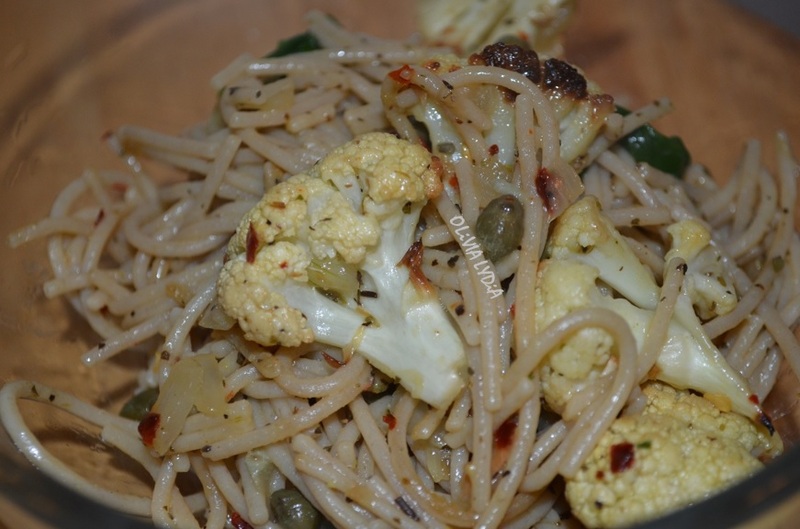 Angel hair pasta, capers and cauliflower?! Yes! I bet you haven’t had this combo yet! Still not convinced you want to try this? Well, how about, dinner will be served in 30 minutes! Tip: Don’t have a vegetable bouillon cube? Use veggie broth instead of the cube and water. Preferably, low-sodium. Note1: You can roast the entire cauliflower just save what you don’t use for later (add to a salad or side at your next dinner). Note2: Roasting the cauliflower is optional but recommended. Steaming it or having it raw is also an option. Preheat the oven to 400 degrees Fahrenheit, if roasting the cauliflower. Lightly coat the cauliflower florets with oil and sprinkle with salt, pepper and oregano on the cauliflower florets. Roast for about 20 minutes, until golden. In a large pan sauté garlic and onions in coconut oil on medium-low heat until translucent. Next mash in the vegetable cube then add water and capers. Finally, add the red pepper flakes, pinch of salt and pepper and cauliflower. After 1 minute, add the pasta. Give it a toss then serve. 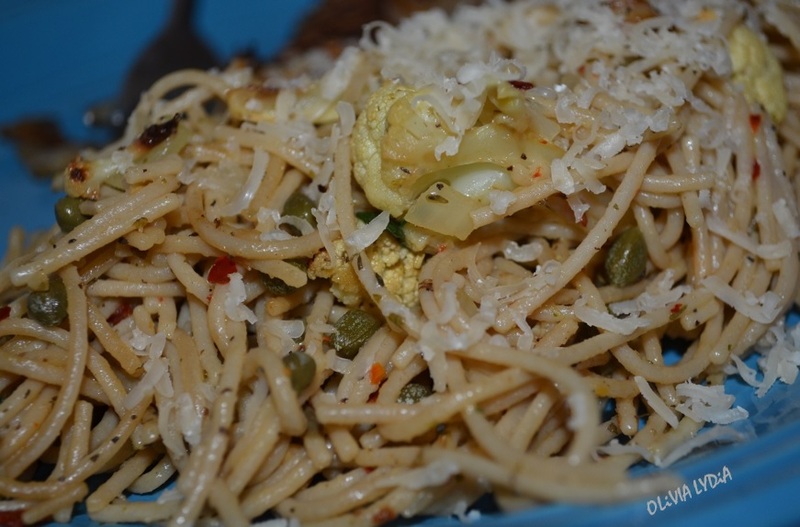 Top with vegan/vegetarian parmesan cheese! Previous Post Give me a Beet… Salad!